Recent float trips have been producing some nice fish. The other day, an angler hooked an 18" brown trout and played it perfectly through several blistering runs before it finally got the best of him and spit the hook. 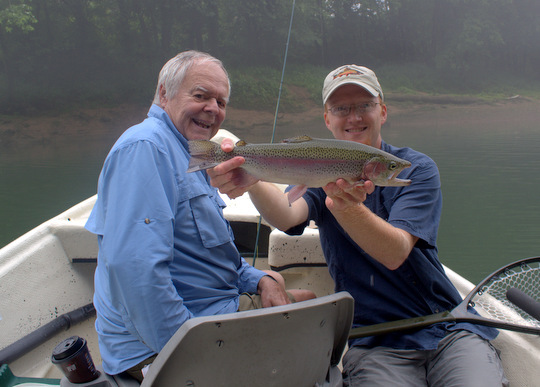 Another recent Fathers' Day gift trip produced a memorable trophy for this dad! I'm not sure if he or his son was more excited. His son did a great job on the camera though while I helped pose the fish. Check out this gorgeous rainbow trout! The lack of recent updates is a direct result of how busy things have been. I'm scrambling to get caught up, but most of my free time is spent keeping a good supply of fish catching flies in stock for guide trips. Lots more is on the way so stay tuned for more reports and thoughts on the current fishing around the area! If you are interested in a guided float trip on the Caney Fork River or in the Great Smoky Mountains National Park, please contact me through Trout Zone Anglers, via email at TroutZoneAnglers@gmail.com, or call/text (931) 261-1884. Bill, I don't think I was clear but this was not my dad. I will be doing a float with my dad soon though in honor of Fathers' Day and I'm looking forward to it immensely! Sorry I did misread, still a happy Father's Day for us Dads.